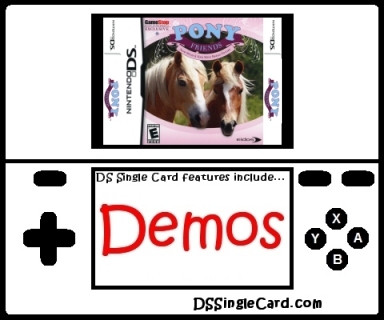 In Pony Friends: Mini-Breeds Edition, "Share Demo" is one of the options right on the main menu. The opening credits are a little longer than average, but can be mostly skipped. Download time is respectably fast. The menu options, while labeled small, are on large, screen-wide bars which are clearly defined and are properly programmed, with no mis-taps or missed taps. The controls, overall, are exactly as expected and are programmed naturally. You gently use the hand icon to turn the pony's head. You pet the pony using the hand icon. You can also use the hand to feed the pony, however the game isn't as accurate as to where in mid-air the food must float for the pony to eat it, and it seems to move around a little bit. Visually, the game looks great. The pony is in full 3D and the food is a 2D/3D hybrid. Sound effects are practically essential to interpreting the pony's reactions to specific actions. Unfortunatelly, the game has no selectable features (before or after the download), very few of the activities are available, and the entire demo will never last more that 45 seconds. I've never been one for Virtual Pets: I've always had the real thing. By comparison, the virtual ones can't provide the same effect, but they also don't require the same level of care. For some people, Virtual Pets may be the only option available to them (due to living conditions, amount of time required, etc.) without there being an option. One type of animal that most people can't accomodate (in great part due to the need for specialized facilities) are horses and ponies, and Pony Friends attempts to fill that void. In Pony Friends: Mini-Breeds edition, "players" can car for, raise, and train their very own regular-sized or miniature ponies. Pony Friends: Mini-Breeds Edition provides the guest with a demo of a Pony they can feed and pet, but little else. Because the demo only lasts for around one minute (or less if you upset the pony), there's no time to train the pony, and to an extent, that's kind of to be expected. After all, the internal storage of the Nintendo DS wouldn't allow for the download of enough game to do training. However, why the demo can't go a little longer (two or three minutes, perhaps) is beyond me, seeing as how the graphics and engine are already involved in the download. Another curious space waster seems to be the doctor's bag of medication. The pony is highly unlikely to get sick in under a minute and, even if does and you give it a pill and it magically instantly recovers, the pony will be gone in a few seconds and you'll either be done or back at square one. The demo is a nice start, but that's all it is... a start -- without any follow-through. Honestly, after playing through the demo a few times trying to make the pony happy and then playing through few more to find out what happens when you really upset the pony (hey, it's research and the pony isn't real, OK? ), there's really not anything to go back for. Allow the host to design a pony for the guest. Provide an indicator of where food is best placed for a pony. Click here to return to the DSSingleCard.com Pony Friends: Mini-Breeds Edition profile.